Packing away clothes for a long time or leaving them wet in the laundry basket can lead to fungal growth on the clothing, known as mildew. In fact, any area with excessive moisture becomes susceptible to mildew growth, which can easily get transferred to your clothing. No matter how many times you wash the garment, the awful smell just doesn’t seem to budge. Towels, linens, and clothes made of cotton and other organic fabrics can hold in moisture for a long time and, therefore, are the common breeding grounds for mildew. Apart from the annoying smell that gets embedded in the fabric, mildew can also pose a threat to your health. When mildew comes into contact with your skin, it can lead to a skin rash. Also, the mold spores stay suspended in the air and can cause respiratory trouble. People living in humid climates have to deal with this menace quite often. However, mildew is not actually difficult to get rid of. A number of household cleaning agents can help kill the fungal growth and treat the funky smell, too. Since different garments have different cleaning requirements in terms of water temperature, wash cycle, type of detergent, etc., do read the garment label before proceeding with any of the cleaning methods. Do a patch test first on an inconspicuous part of the garment to check for any color bleeding or fading. If you have a load of forgotten damp laundry that’s now infested with mildew, use one of the methods below as a presoak to remove mold and mildew from clothes. 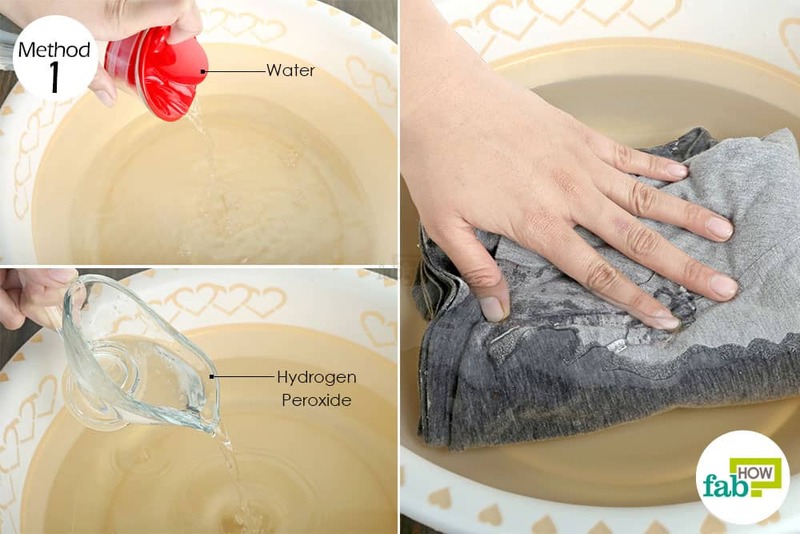 Hydrogen peroxide is an effective cleaning agent and can also be used to kill mildew growth on clothes. The unstable oxygen molecule present in hydrogen peroxide oxidizes the fungus and eliminates it effectively. Food grade 3% hydrogen peroxide is also safer to use on clothes compared to other commercial disinfectants. Note: Hydrogen peroxide is also a natural bleaching agent. Therefore, use only the mentioned quantity or it could fade your clothes. Fill a small tub with 2 to 3 cups of water. Use hot water if your garment label allows. The high temperature will aid in killing the fungus. Mix in ½ cup of 3% hydrogen peroxide. Soak the smelly garment in the solution for 15 minutes, then rinse the garment with water. Launder the item like you normally do. Hang it outside or in a ventilated area and let it air-dry completely. Common household bleach is also a powerful disinfectant that can be used to remove mold and mildew from clothes. While bleach treats the mildew spots completely, it can also fade a colored garment. 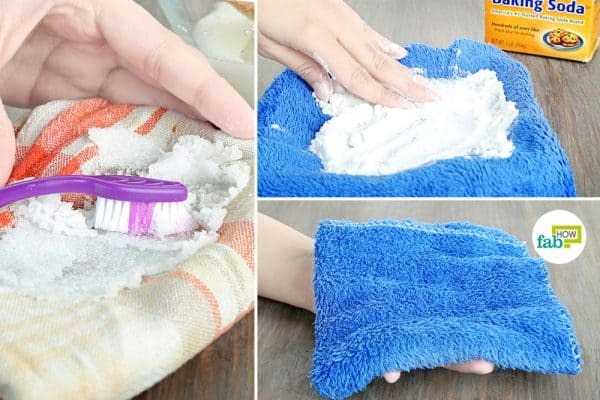 Thus, this method is best for white clothing. Also, check your garment label to ensure that it is bleach-safe. If not, stick to the other methods. Mix ½ cup of bleach into 1 gallon of water. If the mildew smell is not too strong, you can reduce the quantity of bleach to 1 to 2 tablespoons. 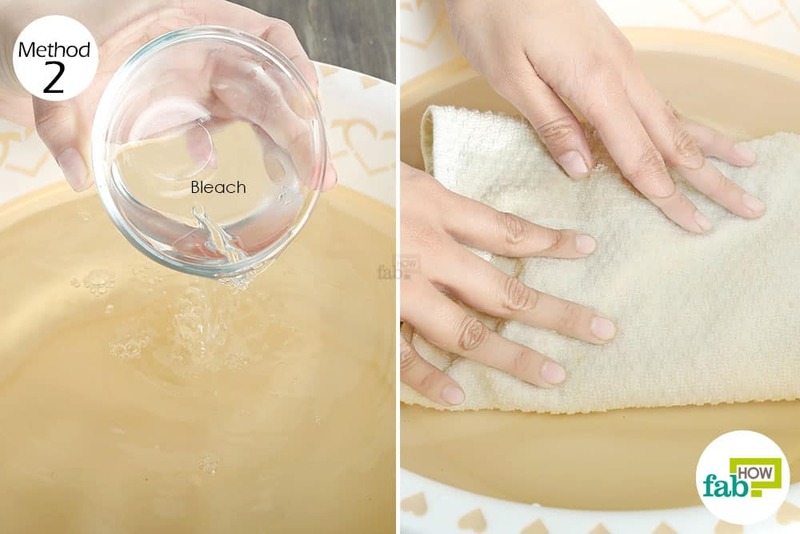 Soak the garment in the solution for 1 hour. Rinse the clothing with water and run it through a normal wash cycle. Allow the clothing to air-dry completely before you put it back in the dresser or closet. Ammonia is a fairly common laundry stain remover that can also help get rid of an extremely persistent mildew smell in clothes. Since ammonia gives off powerful fumes, make sure that the area is well-ventilated before you use this cleaning agent. 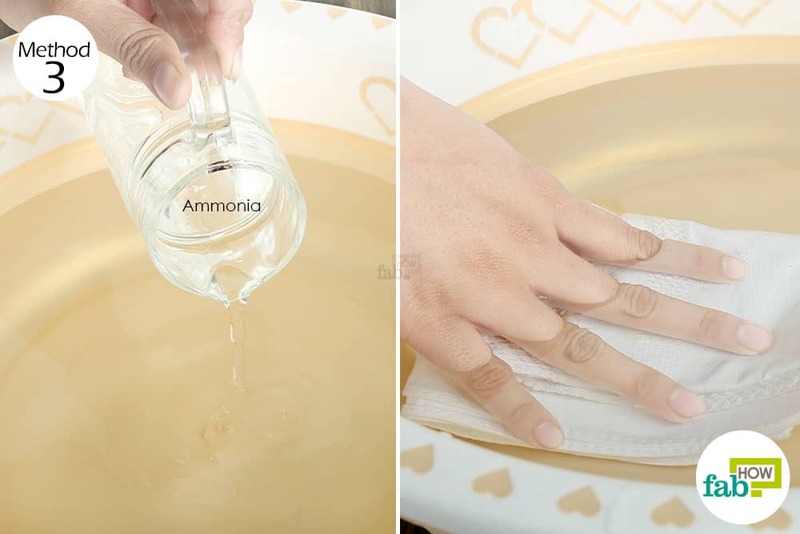 Note: Never mix ammonia and bleach, as it could lead to a toxic reaction. The resultant fumes, if inhaled, can lead to severe respiratory troubles. Mix ⅔ cup of ammonia into 2 cups of water. Soak your smelly garment in the solution for 30 minutes. Rinse it with water and launder the clothing as usual. Rubbing alcohol can also help kill mold and deodorize the garment to get the musty mildew smell out. Like other cleaning agents, you will first need to dilute the rubbing alcohol with water to prevent any damage to the fabric of your garment. 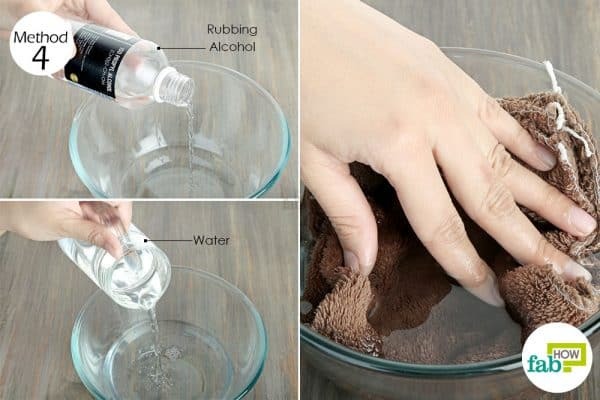 Mix 1 cup of rubbing alcohol and 1 cup of water in a large bowl or bucket. Soak the smelly garment in the solution for 15 minutes. Wash the clothing in the normal wash cycle and let it air-dry. 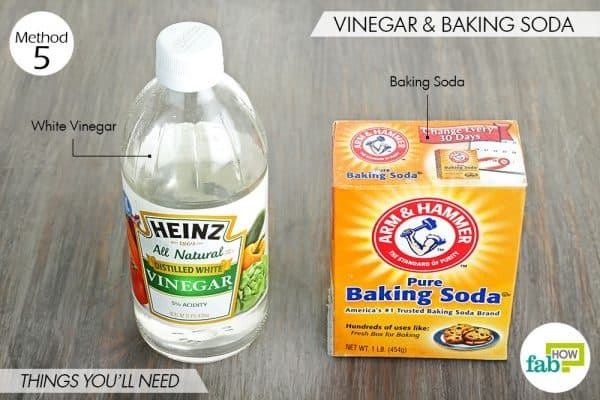 Vinegar and baking soda is a popular combo that can help eliminate almost all kinds of pathogens and can also be used to remove mold and mildew from clothes. 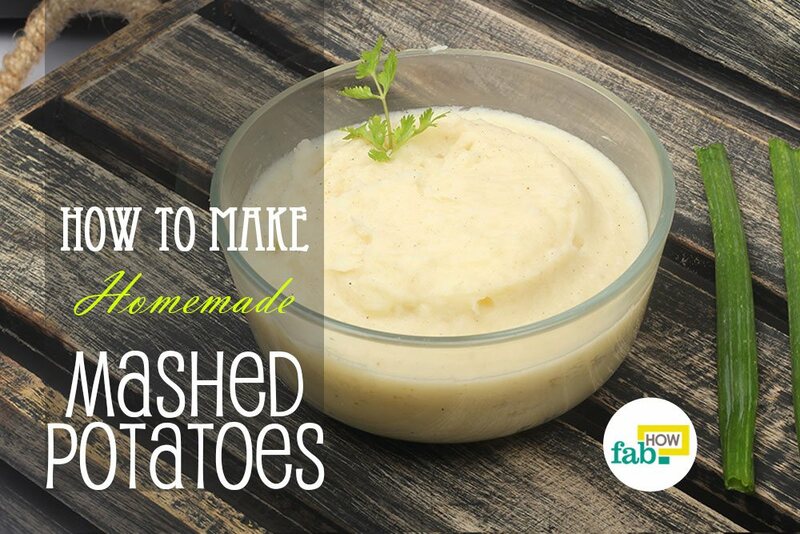 These ingredients are safe to use and are readily available in almost every household. In fact, both vinegar and baking soda can be used together and independently for various cleaning purposes around your home. Place the smelly garment in a bowl. Pour enough white vinegar over the garment so that it is completely damp. Spread out the soaked garment on a flat surface. Pour baking soda on the garment and spread it around to cover the entire smelly surface. Let it sit for 10 minutes. The baking soda will work as an abrasive agent to slough off the embedded fungi. It will also help neutralize the strong vinegar smell. Throw the garment directly in the washer and run a complete wash cycle. Hang the garment out in the sun and allow it to air-dry. 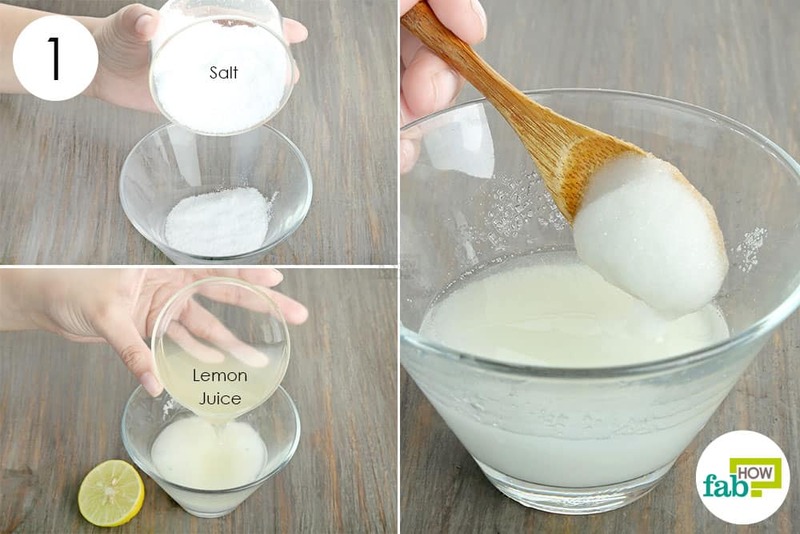 If you’re not a big fan of strong cleaning agents, an alternative home remedy is lemon and salt. While lemon works as an antibacterial and antifungal agent, the common salt will help slough off visible fungal patches on the fabric. Salt also acts as a natural disinfectant. Note: Since lemon is also a bleaching agent, do a patch test first if using it on colored clothing. Put ⅓ of a cup of table salt in a bowl. 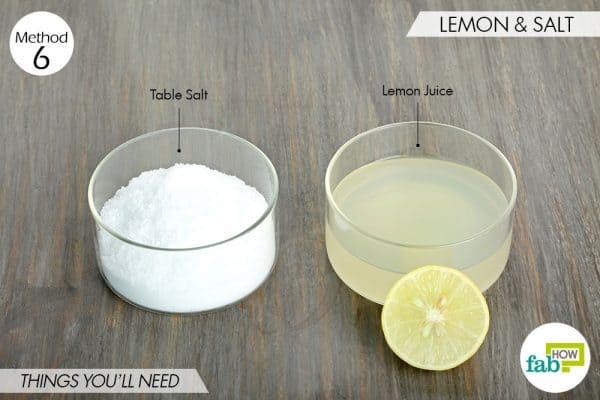 Add ⅓ of a cup of fresh lemon juice. Mix well until you get a runny paste. Apply the lemon and salt paste on the mildew patches on the garment. 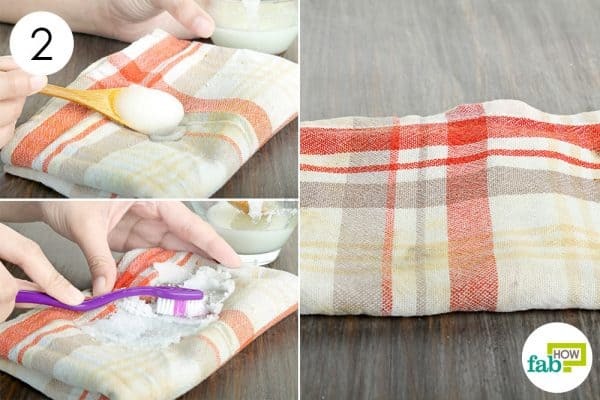 Let it sit for 1 to 2 minutes, then use an old toothbrush to gently scrub the area. Launder your clothing as you normally do, then let it air-dry. Borax is a safer cleaning agent when it comes to removing mildew as compared to ammonia and bleach, as it does not give off harmful fumes. It is an effective laundry booster and deodorizer. Borax is also safe to use on colored garments. Put ¼ cup of borax and 1 cup of warm water in a large bowl or bucket. 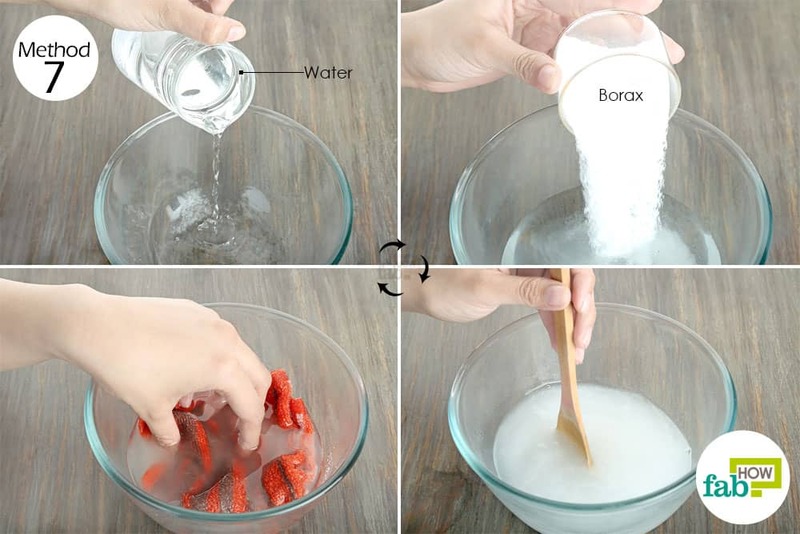 Mix well until the borax is completely dissolved. It’s best to use warm water, as borax will clump up in cold water. However, if your garment cannot withstand warm water, let the solution cool down first. Soak the garment in the solution for 30 minutes, then launder it as usual and let it air-dry. If you have a hard water supply, you can also add 1 cup of borax to your laundry load to keep your garments clean and mildew-free. Always ensure that clothes are completely dry before you fold them and store them in the dresser or hang them in the closet. Drying your clothing out in the sun helps prevent mildew growth. The strong ultraviolet sun rays can effectively destroy the fungus. Retrieve your clothes from the washing machine as soon as they are done. Leaving them in for too long can build up a musty smell. Leave your washer open after doing your laundry. This will prevent any mildew buildup inside the machine. If you live in a humid area, keep your rooms well-ventilated to avoid mildew and mold growth. Keep your washing machine mold-free using vinegar and baking soda. 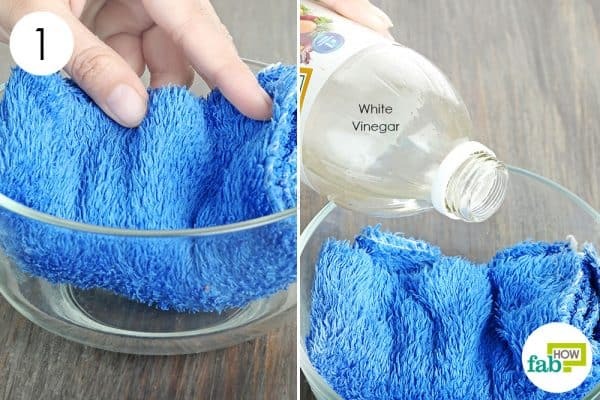 Pour 1 to 2 cups of white vinegar in the detergent drawer. 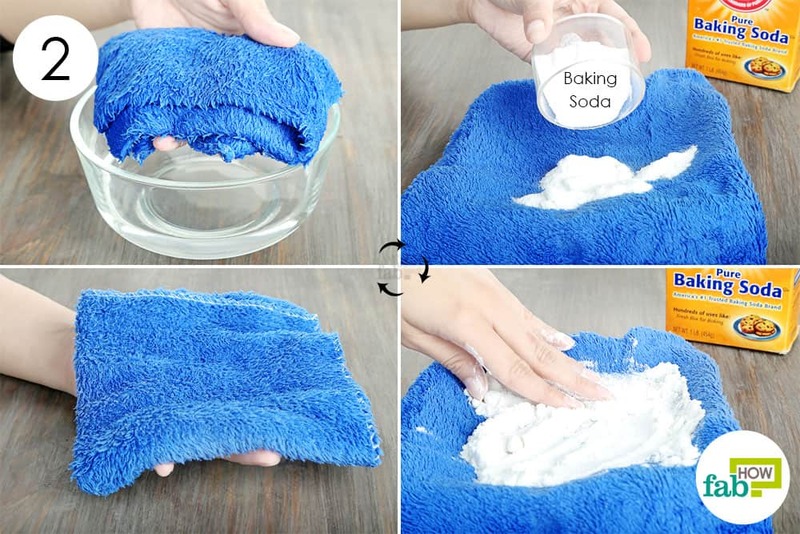 Add 1 cup of baking soda to the fabric softener section or directly into the washing drum. Run a wash cycle on the hottest setting, followed by another rinse cycle.